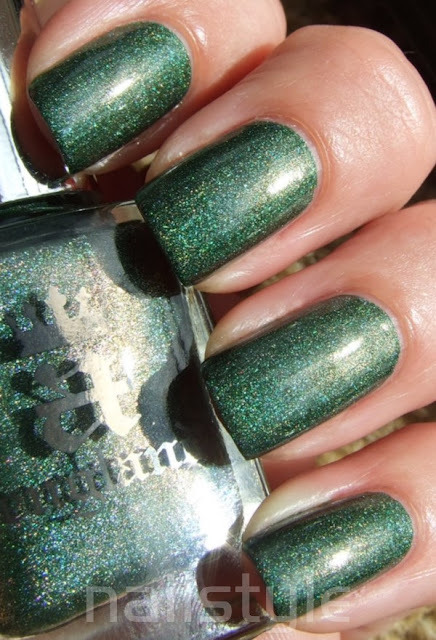 Oh my - I can't believe I haven't stumbled onto these gorgeous polishes sooner! A England Dragon has jumped into one of my all time favourites spot. It's green and holographic so what's not to love! Dragon is a medium mossy green with a scattered holo effect. The formula on this is simply amazing and almost opaque in one coat - yes that's right one coat! I'm looking forward to seeing how this polish stamps. I did apply two coats just because I wanted to cover up some of the ridges on my nails - but as mentioned it really wasn't necessary. The formula glides on like butter and is quick drying. Sadly my pictures really don't do it justice and it's much nicer in real life. Hehe ditto - love your stamping combinations! This is stunning on you. It's a beautiful colour!! I love it!!! !